Ghost Trick: Phantom Detective came out right at the end of the DS's life, the 3DS released a mere two months later. It always seems that towards the end of a system's life a game comes out that captures something special whilst everyone is looking elsewhere. This seems to be the case with Ghost Trick and it is a real shame as it is easily one of the best games of the past five years. 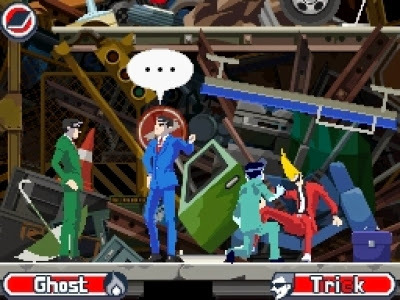 The game's development was lead by Ace Attorny mastermind Shu Takumi and like that series Ghost Trick is full of humour and mystery. You take the role of Sissel... well you take control of his spirit as his body is already dead. You control objects around you and move about space in order to try and solve the mystery of your death. You move your spirit between different objects but the catch is that the objects must be close to one another. You can interact with the objects you posses in order to bring them closer together; for example you may turn on a ceiling fan to move a pile papers and then take possession of a sheet of paper as it flies around the room. The system is incredibly unique, inventive and often hilarious. The game plays almost like a traditional point and click adventure, featuring incredibly well drawn and animated graphics, a rather groovy soundtrack, a fantastic story and a set of characters that are brimming with wit and charm. The game is still cheap to get new on the DS (don't bother with the iOS version!) so go watch some gameplay and get hooked on this fantastic under appreciated gem. Ikaruga was one of the first shoot-em-ups I really felt myself sinking into, although I never got very far! The game has left a strong impression on me which has seen me curious to seek out other creative, bombastic and expertly designed shoot-em-ups over the years. The game was created by Japanese company Treasure who are perhaps best known for creating a handful of classic games for the Mega Drive, all of which share a distinctive colourful aesthetic and a bombardment of attacks and sprites; these games include Gunstar Heroes, Dynamite Heady, and Alien Soldier among others. Ikaruga was Treasure's second shoot-em-up (or third if you include Sulpheed: The Lost Planet which was a collaboration with Game Arts) after the widely praised Radiant Silvergun, a game I have yet to play! 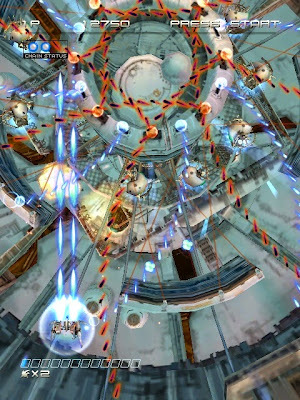 In Ikaruga you control a ship that has two polarities, light and dark, that you can switch between at will. Enemies conform to either polarity or are a mixture of the two, if you match the polarity of the enemy you can absorb their attack which fills up a special attack meter. If you attack an enemy of the opposite polarity they will receive double damage. This simple yet ingenious system sees you change polarity to move through waves of bullets to find a safe area in which to attack. The system also allows for tactical play and chain attacks which go towards a higher score. The game is punishingly difficult and the intensity is mirrored in the synchronized soundtrack which is equally epic. Ikaruga is a fantastic game that feels somewhere between a bullet hell and a tradition shoot-em-up but also feels like something completely unique... plus the whole game was made by only four people, incredible stuff! Animal Crossing is the only life sim that has really captured me and, surprise surprise, it's by Nintendo! The series first started life on the N64 although that version was only available in Japan. I was introduced to the series through the GameCube port of that game which was revamped and expanded for the console. The game was interesting to me as it was forever changing and had no definable end. You live among animal neighbours and go about your time in the village as you wish: buying furniture, repaying your mortgage, planting flowers, fishing, bug catching etc etc. The GameCube Animal Crossing featured a flat world which was segmented into squares, you would move towards the edge of the screen and the camera would switch over to the next square, this could be a little dissorantating and gave the game a disconnected feel. This was remedied in the DS version which I played endlessly at the time although looking back on it now it looks more than a little rough around the edges. 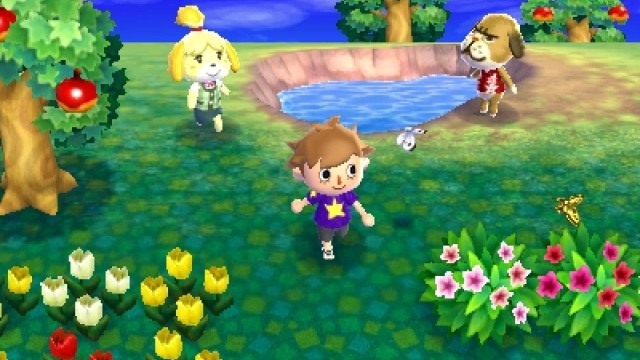 Animal Crossing: New Leaf is the colmination of all that came before it, there is so much to do in this world but the world also feels more alive than ever with a dedicated island where you can meet other players and a vast array of shops to explore. The big selling point of this new game is that through some misunderstanding you are believed to be the new major of the village. You have duties as major but as major you also have the right to change the town so that it works together with your own real life schedule; changes can include having shops that stay open later or open earlier and residents that care for the environment. You can also customise and improve your town with Public Works, these are usually simply visual but some also have major functions such as a police station or a coffee shop. I have spent over a hundred hours with this game and I feel I could happily spend another hundred collecting all the items, bugs, fish etc that I'm still after. If this game included the hidden NES games that were in the GameCube title it would probably rank higher but alas you can't have everything! A fantastic game that keeps on giving. I remember when Super Mario 64 was released, it felt unlike anything else; the control you had over Mario and the way you could interact with and move about the game world gave it a sense of freedom that was unique and new. The game launched Nintendo's 64-bit console and as such is probably one of the best launch titles ever - other great examples being Halo on the Xbox, Super Mario World on the SNES and Ridge Racer for the PlayStation. There are a couple of games - Super Mario 64 and Shenmue - that I distinctly remember thinking represented unparrelled freedom for the player, games that got my imagination going with their new possibilities... did these games have any limitations? I didn't know, I was naive, and so my mind would wander! These days open world games and sandbox games are more common place but back in 1997 it was mind bending. Super Mario 64 has many unique worlds, each of which are contained within the hubworld that is Peach's Castle and the grounds that surround it. Peach's Castle has to be one of the most ingenious hubworlds of any game, it works seamlessly and gets you involved with the game's mechanics before you've even properly started a level. You enter each world through jumping through framed pictures that are scattered around the castle's many rooms. Upon entering a picture you can choose a level to complete within the world, these can vary wildly and often change up the world in the process. Having multiple levels that take place within the same world allows you to really get to know the world, it sees you exploring every nook and cranny for secrets but also has you looking out for what is different. 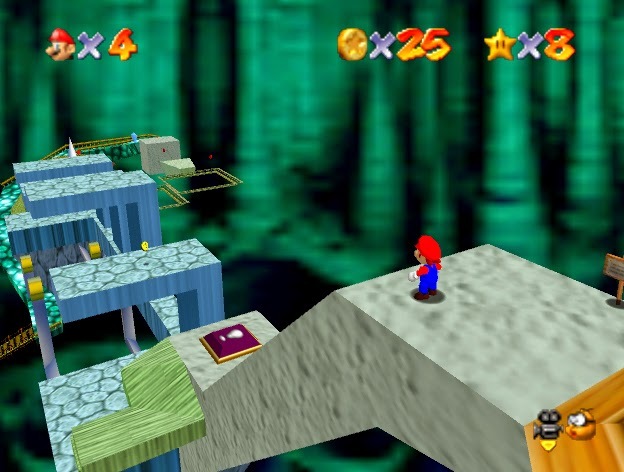 Super Mario 64 is not easy, some of the challenges this game contains are incredibly devious which can make it feel unfair to new players. The game offers a steep challenge for those who intend to seek out everything the game has to offer, but if you do manage to collect all the stars then you'll feel like you've really accomplished something great. The heart of the game is Mario's movement through 3D space and controlling him is always a joy thanks to the N64's analog stick. His large repertoire of moves offer him many strategic gameplay possibilities and are often called upon so you have to be on your toes at all times and know the controls inside out. The only issue the game has is its camera which must be continuously turned with the N64's C buttons, it feels archaic by today's standards and can get in the way of the overall enjoyment. An incredible 3D world and a classic game that represents so much of what makes games great. 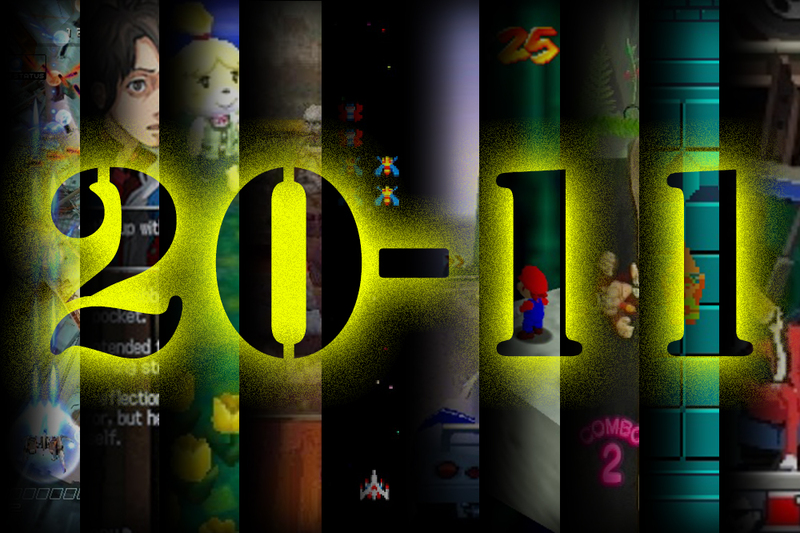 A game that defined the N64 era and still has a lot to teach to budding game makers. I have always been a fan of arcade style games. I love games that rely heavily on solid gameplay mechanics paired with distinct graphical styles and easy to understand themes. I also love games that are easy to pick up but hard to master, and for me Galaga ticks all the above. Galaga was released to arcades in 1981, it was a sequel to Namco's biggest hit at the time, the Space Invaders clone Galaxian. That game differentiated itself from Space Invaders through unique additions to the early arcade shooter formula. Your ship was now more detailed and the graphics in general had more personality to them thanks to the addition of colour; but the biggest changes were in the gameplay. In Space Invaders waves of enemies would slowly march back and forth across the screen, each time getting closer and closer to your ship, you shot and took cover behind rocks and were tasked with wiping the enemy ships out before they reached the bottom of the screen. In Galaxian there are no barries and the enemy ships each have unique personalities. The enemy ships of Galaxian wait impatiently at the top of the screen before flying towards you spraying bullets, if you miss them they will reappear at the top of the screen and try again. This more aggressive behaviour makes the game far more exciting to play than Space Invaders and adds a lot of drama to the gamplay. 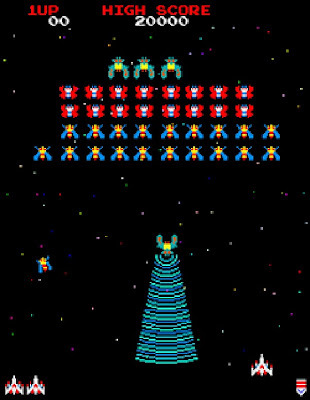 Galaga expanded on Galaxian with more enemy types and a general refinement to the gameplay experience. Enemies were still aggressive but felt easier to manage as their attack and flying patterns were much easier to read. This made the game seem less punishing and made it much more fun. One of my favourite additions that Galaga made was the twin ship mechanic; there are certain enemies that instead of shooting you will use a tractor beam, if you get caught in this your ship will be taken and you will lose a life. The enemy holds onto your previous ship but if you can carefully shoot down the enemy as it approaches you again your previous ship will rejoin you. The previous ship will stick to the side of your main ship and allow you to have double the range and fire power. This mechanic is fantastic, adding an element of risk/reward and providing a lot of strategy and tension to the gameplay. The game also features some of the best bonus levels of any game, with enemies dancing around the screen as you are tasked with shooting down as many as possible. The enemies do not shoot at you during these section so they act as a nice reprieve from all the built up tension. I absolutely love Galaga and I always have done ever since I played the short demo in Ridge Racer; a phenomenal game and easily one of the best arcade games of all time. 999: 9 Hours, 9 Persons, 9 Doors... kind of a mouthful! The game is known in Japan as Extreme Escape, a title that more directly represents the gameplay. 999 is a game that mixes many different elements; it's part interactive novel, part 'get out of the room' puzzle and part graphic novel. 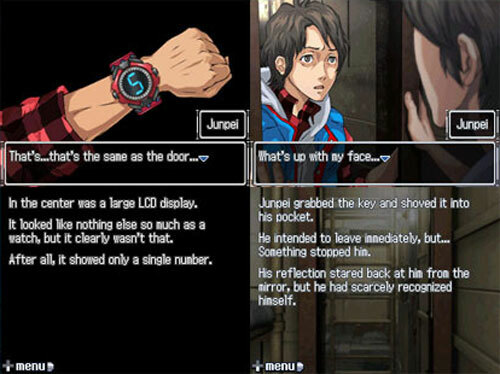 In the game you take control of Junpei, a boy who - along with 8 others - wakes up on a cruise ship with a mysterious numbered watch attached to their wrist. Whilst still in a daze the cabin window breaks, gushing water into the room, Junpei must figure out how to get out of his cabin in order to survive. You quickly learn that this isn't going to be easy, you must move the camera around and find areas and items to interact with in order to solve a long winded puzzle just to get the door open. Once you have escaped the room you run down to the main foyer and meet up with 8 others who all look just as confused as you. After a brief message from the mysterious antagonist named Zero you quickly learn that this is all an elaborate game, and that the choices of the 9 individuals will determine who will gets off the cruise ship alive. From here on its tense bloody storytelling all the way! Interactive novels as videogames is a concept that has been around for many years in Japan but has never really found popularity outside of that country. The closest equivalent I can think that we have is the point and click adventure, a genre that 999 borrows heavily from. The unusual genre as well as the fact that the game has multiple endings intrigued me and got me to give the game a try... and I wasn't disappointed! I won't go into any further details regarding the story as I feel that a good +50% of the enjoyment you will get from this game is through uncovering the mystery and trying to find everything the game has to offer. The game has many branching paths where your decisions and actions will effect how the story will progress. The branching storyline is done incredibly well and gives the game longevity and provides tension to the story, you never know who to trust or what will happen next. Each character feels incredibly detailed and real, their decisions as individuals all add up to a game that feels incredibly dramatic and often brutal (there's a reason this game has an M rating!). The game was ported to iOS in 2014 but this version doesn't include puzzle elements and is instead just the story. I feel that through doing this the developers have sacrificed a lot of what makes 999 great and so I would urge people to stick with the original DS version. The game was not realsed in PAL regions so you will have to get a North American copy, this will play on all DS and 3DS systems though. The game received a sequel in 2012's Zero Escape: Virtue's Last Reward for the PS Vita and 3DS, I have only played an hour of the game so far so I can't really comment on it but what I will say is that it isn't capturing me quite like 999. Here's to more games like this being released over here, a mature game with great puzzles, memorable characters and a branching story that has you guessing right up until the final moments. A phenomenal game and my favourite game on the DS. I have to be honest, although I quite like the Zelda series I have only played a handful of the games to completion; Oracle of Ages, Minish Cap, Twilight Princess, Skyward Sword and this, my favoruite and the game that started it all. Upon playing this game for the first time - about a year and a half ago - I was shocked by just how many Zelda tropes were present. The game can initially feels a little primitive but as you delve deeper into it you come to realise it still influences the direction of the series and is still relevant to gaming as a whole today. 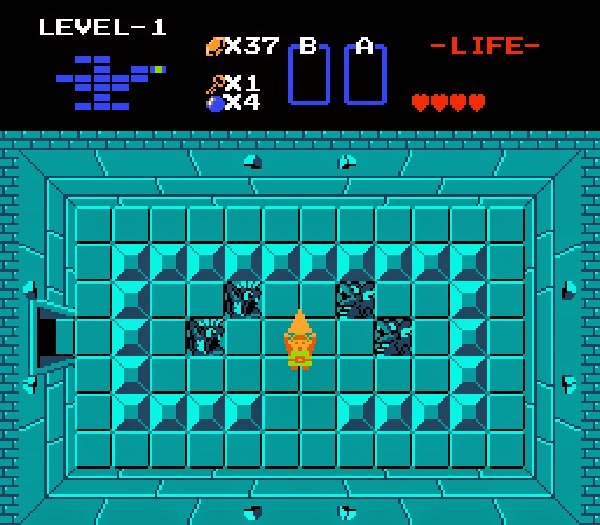 The Legend of Zelda for NES is a fantastic open world adventure game full of unique and often infuriatingly hidden items, tricky enemies and some grueling dungeons. Upon starting the game I wandered into areas full of hostile enemies but soldiered on regardless, dodging enemy attacks and making it to the entrance of the third dungeon. The fact that I could get to, never mind complete, the third dungeon before the first and second was surprising to me. This open structure is incredibly refreshing and gives the player a sense of freedom that only makes the game feel more wondrous and alive. Giving the player the freedom to complete the dungeons in any order has only recently been revisited by Nintendo with the release of A Link Between Worlds for the 3DS and shows that the NES original still has much to give. 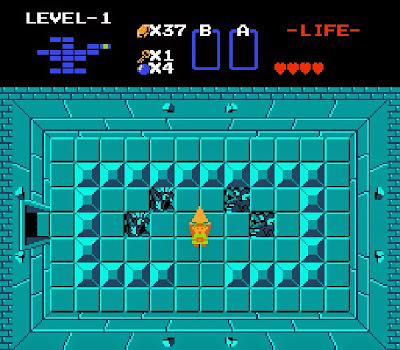 The feeling you get when you find your way to the end of a dungeon, find a hidden area or pick up a new item is incredibly satisfying, bringing you closer and closer towards your inevitable fight with pig-faced Ganon. The game is challenging and perhaps somewhat idiosyncratic but the fun you will have and the influence the game has had cannot be overstated. A remarkable game that I enjoyed way more than I was expecting. When Resident Evil was released in 1996 the gaming landscape was very different to it is now, for starters Sega were still in the console business and trying to capture the market's attention with the Sega Saturn. The leader of the pack was obvious even in the early days though, the new kids on the block, Sony, were making traction and growing rapidly with every month. August 1996 saw Resident Evil launch in Europe for the PlayStation, it would not be released for the Sega Saturn until the following year. The PlayStation was only a year old at the time and grabbing games before Sega was instrumental to their early success. Resident Evil was a big game for Sony, although I doubt anyone knew quite how big it would be. The game would mark the beginning of a partnership with Sony that saw the PlayStation name become synonymous with the classic Survival Horror series and more importantly gaming aimed at young adults. I was 8 years old at the time of its release and catching glimpses of my older brothers playing the game had a profound effect on me. I still had a naive and active imagination so when I came to see the game it felt like a new frontier. From the intro onward it felt like something completely new to me. The intro featured fantastically terrible real life actors, speech, special effects and a creepy mansion... it was all a bit too much for me at 8 years old! 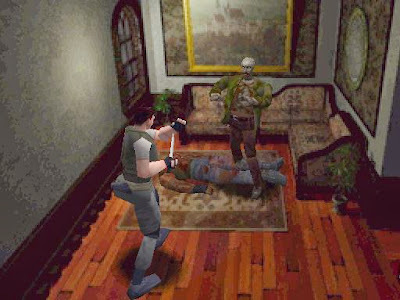 Then came the absolutely classic shot of the man running down the corridor and the ominous 'Resident Evil' voice that would signal the start of your game, it was so dramatic and corny but also worked brilliantly. I would not play the game until a little later but the effect it initially had on me hadn't worn off... and in a way it still hasn't. The game still retains some of its original tension thanks in most part to its unique personality, it's just so weird and off! The game was, for most people, the first true Survival Horror game. You can choose between two characters, Jill or Chris, each have a slightly different campaign but the main difference is that Chris has a much smaller capacity for holding items and starts with nothing more than a knife! Jill is the way to go for newcomers but even still the player is tasked with managing an incredibly limited amount of ammo and chances to save the game. To save the game you have to use up a scarce item called an Ink Ribbon at one of the games typewriters. The scarcity of the Ink Ribbons mean the player is always afraid to save in case they run out later on but they are also afraid not to save for fear of what is through the next door. This simple mechanic changes the whole game and gives it an incredible amount of tension. There is so much more to say about the game but I don't want to spoil it for those who haven't played it. The game uses what people refer to as 'tank controls' but don't let that dissuade you from playing this absolute classic horror game, they're really not that bad! The game received a remake on the GameCube which is essential too but I prefer the original. The original has a kooky atmosphere which is lost in the remake and the original aesthetic makes the game more creepy in a strange way. The remake was recently re-released for modern consoles and Steam so you have no excuse not to pick it up on way or another! Before Donkey Kong Jungle Beat I had very minimal past experience with Donkey Kong games, apparently we had an SNES and Donkey Kong Country at one point but to be honest I don't remember playing it too much (I was probably busy playing Sonic or Jurassic Park on the Mega Drive!). I cannot remember exactly why but my younger brother and I decided early on that the GameCube was the system for us and we supported it through its short and turbulent life. We had many systems off and on over the years but the PlayStation was our go to console so I guess it was a very conscious decision... and I am still happy with our young defiance (we ended up with a PS2 as well so... hmm?)! Some of the first games we got for the system were Resident Evil Remake, Eternal Darkness, Super Mario Sunshine, Super Monkey Ball and Wind Waker... all classic games. The form factor and the colour of the console as well as the design of the controller marked the GameCube out as an outsider; a position Nintendo would flaunt with the DS and Wii era with innovative touch and motion controls. Although the DS and Wii hog the limelight the GameCube's forays into unusual control methods should not be forgotten. The standard controller had incredible analog triggers that were not only precise but also had clickable buttons upon full depression. The GameCube had the first official wireless controller with the Wavebird, had connectivity with the GBA for a second screen experience years before the Wii U and there was an optional microphone for games such as Odama and Mario Party. The controller I want to talk about here though is the silliest but most physical and kinetic of all; the DK Bongos. The DK Bongos followed the surge of dance mats that littered bedroom floors following the success of Konami's Dance Dance Revolution. The Bongos took on a form similar to the Taiko no Tatsujin drum arcade machines but as well as two drum pads they also had a microphone built into the center that would pick up the user's clap. The controller was released with the conservative but fun Donkey Konga, a standard rhythm game full of pop song covers and Nintendo classics such as the DK Rap. Jungle Beat was announced during the release of Donkey Konga, this next game would be a traditional 2D platformer that would have some combat elements that would ask you to pummel on the skins of the bongos to beat your enemies; I was curious as to whether this concept of pairing a rhythm controller with a more traditional game model would work... oh, how they made it work! 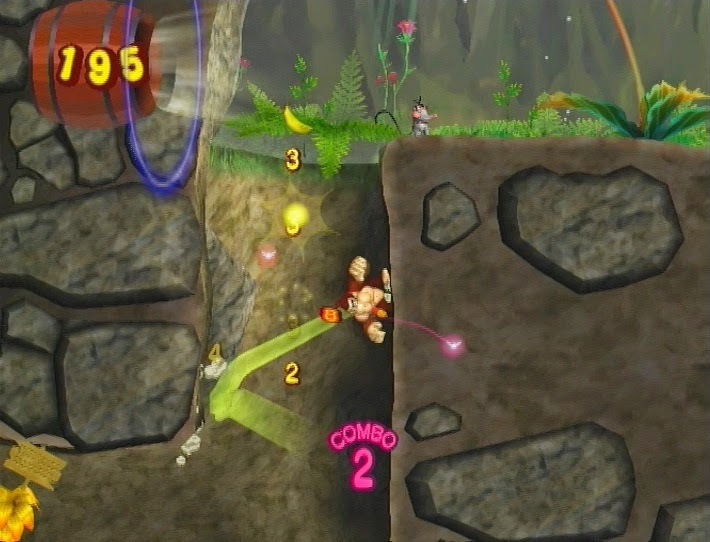 In Jungle Beat the bongos control Donkey Kong's movement, left and right bongos move him in either direction while pressing both at once sees him jump in the air. Clapping makes Donkey Kong interact with his environment (moving objects out of his way, breaking things, stunning enemies etc). The main fun of the games comes in the variety of gameplayand the point system which sees you tying together all your movements into one long strategically choreographed dance. There are stages that break up the typical platforming as well, these include levels that have you fighting one on one with an enemy or riding a wildebeest that is continuously moving right. The game plays so well with the bongos that I didn't even attempt to play the game without them (something you can actually do if you need to be quiet I guess! ), it feels as though the game has been made from the ground up with the bongos in mind, with the design considering how the user will interact with the environment. The physicality of hitting the drums and their mirroring on screen in Donkey Kong's actions just feels so right and the game could be seen as a testing ground for many ideas that would be expanded on in games such as Super Mario Galaxy as well as the entire concept of the Wii. An underrated gem that is always fun to break out. Two Ridge Racer games in one list!? That's right, Ridge Racer means a lot to me, I won't defend the series' recent output but I feel the PlayStation games stand out as some of the best racing games of all time. Ridge Racer Type 4 was released in 1999, the last full year before the PS2 was released. Although the PS2 was just around the corner we would still receive many great games; games including Tony Hawks 3 and 4, Omega Boost, Dino Crisis 2 and WWF Smackdown. What is evident in these games is how developers really started to understand and truly master the hardware. If you compare Ridge Racer to RRT4 the differences are like night and day, the scope became so much wider and the graphics became more impressive and realistic. 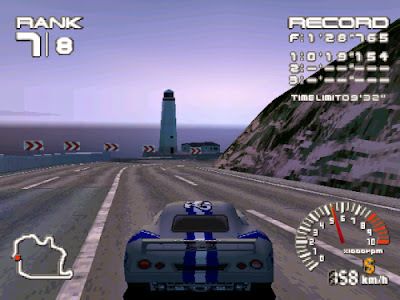 After the release of the original Ridge Racer we would receive a semi-sequel in RR Revolution which featured very similar graphics but a new set of tracks. Shortly after that we would receive the black sheet that is Rage Racer, the game that introduced a monetary system and featured a much darker and realistic graphical style. Some did not like this particular entry but after I got over the change in style I found that it was a game that suited the home console market much better due to its longevity. With RRT4 the developers built upon Rage Racer's formula to create the deepest and most immersive game in the series. The game features over 300 cars, split between four different racing teams and two racing styles. The surprisingly robust career mode features an in-depth story that sees you team up with one of the four teams and trying to help them win the tournament. Between races you speak with the team's boss, they'll comment on your progress and talk about personal issues such as their families or why they got into racing in the first place. These sections are very well written and getting to know each of the teams is rewarding. How well you do in each of the tournament's races determines what car you will unlock next and so you have to go through each team's campaign multiple times in order to unlock all the available cars. The game takes inspiration from Gran Turismo in terms of scope but it also retains the incredibly fun arcade mechanics that the series was built on. The game is an absolute joy to play, especially with Namco's own Negcon controller. The game was released with a brand new and frankly bizarre controller called the Jogcon that is fun to use if a bit odd; I say stick with the earlier more precise Negcon though. Nothing compares to speeding round Shooting Hoops in the fastest car in the game with new year's fireworks blasting off in the background, just one of many magical memories from my second favourite racing game of all time.